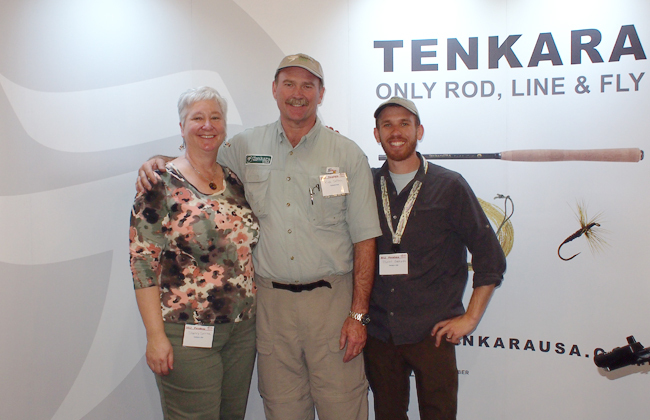 The Pasadena Fly Fishing Show is over, and we consider it another great success thanks to the kind and energetic help of Rick and Sherry Setina, two passionate tenkara customers who volunteered at our booth to introduce people to tenkara. A huge thank you Rick and Sherry for the incredible help! The fact that both of you brought so much good energy to the booth (and did it completely free0 is a reflection of the passion of tenkara anglers for the method! A huge number of people became converts this weekend. As always, it was great meeting tenkara anglers who came by to say hi! The night before the Pasadena Fly Fishing Show kicked off, my wife and I, and Ben and Brook, the awesome couple who runs theanglingbookstore.com and also help run the Fly Fishing Show itself, headed out to a famous comedy club in the area. It turned out, the comedian for the night was too drunk to remember his routine, if he had one. He kept repeating the same not-so-funny jokes, and what is worse, kept asking the audience for topics which he did not have any jokes for! Well, inevitably we shouted out “fly-fishing!” as a topic. He danced around it and said he didn’t have a joke, going back to the same old jokes he had been telling all nigh. He did, however, say he had a story about fly-fishing that he would tell later, not a joke, but a story. Later that night he remembered the story, and it actually went well in the context of fly-fishing, the fact that Ben and Brook live in Colorado, and the story behind tenkara’s introduction to the US. He told us, how he went fly-fishing once. He and his girlfriend went camping in Deckers, CO for a couple of days between some shows (when he mentioned he was in Deckers we could tell he was telling a true story as I was fishing there last year). They didn’t have anything with them, but saw a dad and his son doing this really cool thing on the stream by their campground: flailing their rods around, making the line do all this cool stuff in the air. They wanted to do something and that looked pretty cool. So, they headed to a store nearby. As they didn’t have money to buy a rod nor wanted to completely get into the sport they just bought some fishing line and some hooks with feathers on them (flies, I’m guessing). They headed to the stream where the dad and son were still fishing. Not having a rod, he found a branch, tied his line and fly to it and put it in the water. He didn’t believe he would catch anything with that hook. Yet, he kept his fly in the water. A few minutes into it, and after watching dad and son fishing for a while and not catching anything, he had a fish on! Only a branch, line and flies, and he had caught a fish. The comedian started talking about how the dad and son had all this stuff on them, these vests full of pockets, fancy looking rods and bright lines, and hats and accessories and the whole thing! They looked cool. But, he was the one with the girl and the fish on the line! We were laughing a bunch at the story. I just wish the comedian knew we laughed not because he was funny, but because of the context. David Lofthouse stopped by our booth wearing a shirt from www.thefiberglassmanifesto.com. It was a good time Daniel. Several friends of mine came by the booth and a few bought rods. The funniest one came at the end of the show on Saturday when a couple of friends, Ariel and Karen, came by. Ariel enticed Karen to cast the Ito and by the time she was done she fell in love with it. They talked a bit and then said they’d think about it and would probably buy one online. They walked out and got somewhere near the parking lot, turned around, and came back and bought the Ito. Karen will be using her new Ito on Montana in the very near future. My girl and I really enjoyed seeing your booth. We both learned a lot about how get the most out of my Tenkara. Of course, ever since she picked it up, I have not been able to touch it. Keep up the good work.